LAS VEGAS — President Trump had strong words for U.S. Democrats this past Saturday, including Minnesota Rep. Ilhan Omar, whom he called out just hours after it was revealed that a New York man had been arrested for threatening to kill the congresswoman. 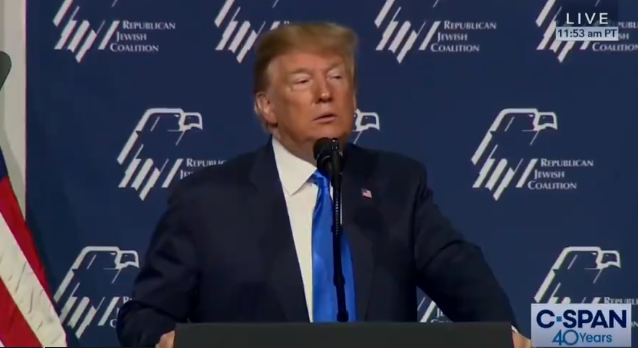 “Democrats are advancing the most extreme partisan agenda by far in American history…people aren’t fighting for Israel in Congress,” Trump said during a speech at the Republican Jewish Coalition here, during which he seemed to refer to American Jews as if they were Israelis. Trump also called out Omar for her own stance on Israel. Trump’s comments on Omar came just hours after details emerged that a New York man who said he “loved” the president was charged with threatening to kill her. The man, Patrick Carlineo, Jr., was arrested after placing a call to Omar’s office during which he called her a “terrorist” and threatened to shoot her, federal prosecutors said. “Do you work for the Muslim Brotherhood? Why are you working for her, she’s a f**king terrorist? I’ll put a bullet in her f**king skull,” the 55-year-old man allegedly said, according to a report from The Independent. Omar made headlines earlier this year for implying that U.S. politicians support Israel because of lobbyists’ money. With Israeli Prime Minister Benjamin Netanyahu set to face challenger Benny Gantz on Tuesday in the country’s election, Trump seemed to hint at his preferred candidate, referring to Netanyahu as “your prime minister” to the gathered audience of American Jews. Trump also reportedly touted his decision to move the U.S. embassy to Jerusalem from Tel Aviv, as well as his recent controversial recognition of Israeli sovereignty over the Golan Heights.